In 2007, 140 families were relocated from Botezari and Kolsa villages inside the Tadoba-Andhari tiger reserve in Maharashtra. The families, mostly subsistence farmers, were given a new address 70 km away--Bhagwanpur village, Chandrapur district. Two years on these villagers are starving. They have not been able to grow crops though each family was given a little more than two hectares as part of the rehabilitation package (see 'Tadoba tiger reserve: An unsafe haven', Down To Earth, May 15, 2008). Reason: the authorities failed to provide irrigation. The villagers repeatedly pleaded for a water tank to irrigate their fields. They were ignored. Worse followed.When some villagers returned to the forest to collect bamboo and tendu leaves that they could sell and earn a few rupees, they were arrested. Twenty-four families set off for Botezari on May 20. "We reached our village in the reserve at 8 pm and rested the night. We were cooking our meal the next morning when the police came and arrested 16 of us," said Saraswati Kannake, former sarpanch. The day before the villagers had told the collector that they would return to the forest even if it meant risking arrest as their demand for water tank was not met. The villagers were charged with trespassing, felling trees, conspiracy and interfering with government work. Park director Sheshrao Patil said the villagers felled 60 to 70 trees. "All we did was collect a few branches for fuel," said Kannake who was given bail on personal bond in early July along with 10 others. The remaining five were released a few days later. Lawyer Pravarja Mahajan of non-profit Human Rights and Law Network said the charges against them are severe. She is helping them fight the case. 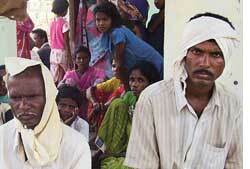 While the villagers were in jail, their families in Bhagwanpur were starving. Eighteen-year-old Lalita Pendam and her younger sister Nirasha were living on a few handful of rice borrowed from neighbours. Manda Madawi and her four-year-old daughter did not even get that. The villagers said they were not able to grow any crop the year they shifted as the allotted land was not levelled. In 2008, their crop failed due to drought and lack of irrigation facilities. Each family lost Rs 15,000-Rs 20,000. Since November last year, the village is surviving by selling mats made of bamboo from the forests, said Dilip Nannawre. Each family earns Rs 50 to 60 a day. Asked why the villagers could not be provided a water tank, district collector Pradeep Kalbhor said it was the job of conservator forests North Circle. The conservator Ramjee Yadav said: "Relocation is over. Development work has to be done by the revenue department." Kalbhor later said surveys were carried out to identify land for the water tank, but offered no explanation why a site could not be decided even after four surveys; a fifth survey is in the offing. The villagers were given some help under the National Rural Employment Guarantee Scheme (nregs), but it was discontinued in October 2008. Kalbhor said the villagers are unwilling to work. Villagers denied this. "Last year all field bunds were made with nregs funds. We never got timely or full payments," said Bhujang Madawi. A day after the arrest, the administration gave work under nregs but for a few days, said Sarang Dabhekar of Gurudev Seva Mandal, a non-profit. "All we want is a water tank. Why can't they give it to us?" asked 76-year-old Pandurang Surpam. The villagers said they have no choice but to return to Botezari. "The water tank there is still in good condition. If we had cultivated our old farms this year, there would have been enough to eat," said Vishnu Shankar Gadmade. Their return may lead to another round of arrests.